The Woodland League launched a new Native Trees initiative on Tuesday 7th March, during National Tree Week. The project is linked to the message of the new film, “Call of the Forest, the Forgotten Wisdom of Trees” by Diana Beresford Kroeger, consultant scientist to The Woodland League whose work is featured in the film. This is a call for native woodland restoration on a global scale by the people for the people. 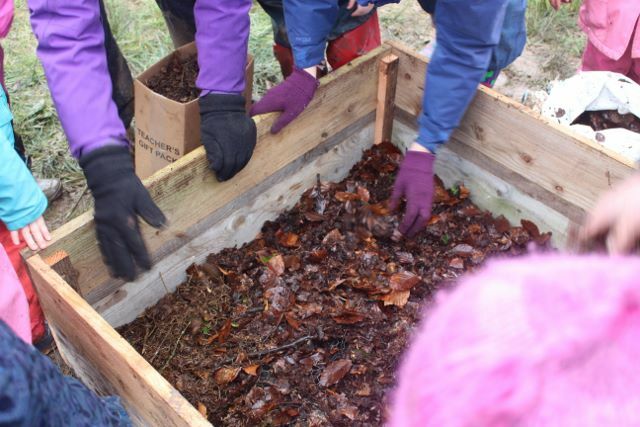 The tree seed incubator box under the supervision of Andrew St Ledger, PRO of the League, was then activated with the children participating, spreading the leaf litter mix, then following up by casting the native tree seeds of hazel and oak which they had collected in the nearby Raheen ancient oak wood. Andrew said, “These children are investing in their own future in a unique way that combines the past, present and future, it is amazing that some of the acorns are from the legendary local Brian Boru oak tree, reputedly 1000 years old”. The box uses a copy of the natural forest floor of leaf litter to start the trees off, the sides creating shade to encourage the trees to reach for the light with fine mesh across the bottom and the top lid to protect the seeds from being eaten, so increasing their chances of survival by 90% or more. Each one metre by one metre seed box is capable of providing approximately 200 healthy native trees for planting out every two years. Ideally the seeds are collected by the school children within a ten mile radius as it is a fact that these native trees are the most adapted to the area, and therefore the most valuable in providing Ecosystem services, such as, wildlife habitat, water filtering, soil protection, flood prevention, etc. This was followed by placing the lid on top of the box to protect the seeds from birds to give the seeds every chance of survival with the children all singing a song to welcome the seeds and wishing them every chance of success. The plan is a grassroots led initiative to inspire the creation of new community native woodlands. To fund the boxes, The Woodland League have produced a very attractive signed certificate to acknowledge donations above 100 euros which will be posted to the donor with their name inscribed, these collectors items can then be framed by the donors. We are also seeking business sponsors and will of course accept small donations too – see our Donations Page. Andrew St Ledger, went on to say, “This is a great example of Sustainable Development, by acting locally and thinking globally communities can take direct action to combat Climate Change. Initially focusing in on a 100 square mile footprint of a once mighty oak forest, beloved of Brian Boru, the last High King of Ireland, known as The Great Forest of Aughty, The Woodland League intends to gift a box to every national school in this region of Clare/Galway”. The plan is to increase the reach of the project nationwide over the next five years to install “A Forest in a Box”, in every national school. The aim is to inspire the creation of new native woodlands in the footprints of old native forest sites, creating a new appreciation for the known multiple benefits to be gleaned from restoring our much neglected Native Woodland Resource. Interview with Andrew St Ledger on Connemara Community Radio March 16th, 2017, discussing the “Forest in a Box” project. 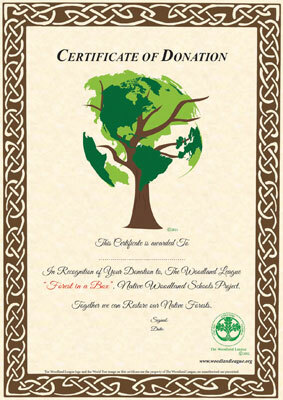 This attractive signed official Woodland League, Certificate of Donation will be printed on quality paper, with donors name recorded and posted to those, if requested, giving 100 euros and over towards this very worthy grassroots project. If you wish to avail of this opportunity, please send an email to thewoodlandleague@gmail.com confirming your Paypal or other donation with your full name and address.